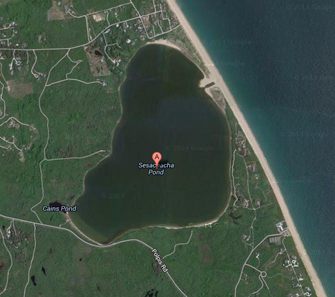 Deemed one of the island’s cleaner bodies of water by the Massachusetts Estuaries Project, Sesachacha Pond is Nantucket’s largest kettle pond and is probably the deepest pond on the island at 43 feet. Its northeast and southeast shores sparsely populated with seasonal houses, most of Sesachacha Pond is surrounded by conservation land owned by the Massachusetts Audubon Society called the Sesachacha Heathlands Wildlife Sanctuary. There’s a small pond off of Sesachacha’s southwestern corner connected only to Sesachacha when their water is high enough run between each other. The smaller pond is surrounded by cattails, common reeds and some swamp rose mallows while Sesachacha’s shore vegetation is heathland species In the main pond, Native Americans built basic piers of large rocks they hauled to the pond and laid out into the water a certain distance and height, so they could walk out into and spear fish in the deeper parts of the pond. eiders, scoters, golden eyes, buffleheads and mergansers. As of 2014, the town’s Natural Resources Department had begun experimenting with growing oysters — starting with an initial batch of 10,000 — in this pond, which used to support a large, productive natural population. Although wild oysters do grow in this pond, they don’t seem to reach more than two to two-and-a- half inches. The town opens this pond in the spring and fall, but its Estuaries Report recommends opening it at least once more to further cleanse it. Access to Sesachacha Pond is along Polpis Road and Sesachacha Road off of Quidnet Road.